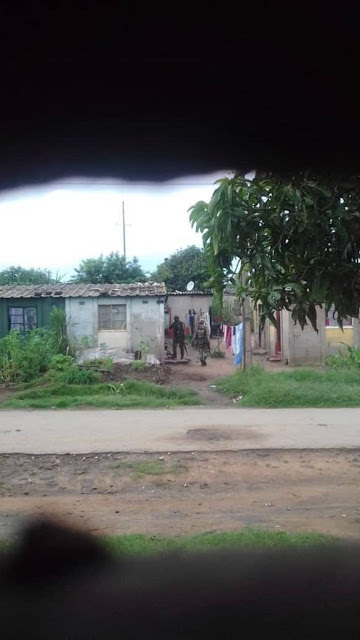 (Reuters) - Soldiers patrolled city streets in Zimbabwe on Tuesday and confrontations with angry civilians threatened to boil over, a day after violent protests led to the death of three people, including a police officer. Monday’s unrest followed sharp increases in fuel prices decreed by President Emmerson Mnangagwa, five months after post-election violence during which six people died when the army intervened to quell trouble. Zimbabweans accuse Mnangagwa of failing to live up to pre-election promises to kick-start growth, having seen their purchasing power eroded by rampant inflation. As security forces faced accusations of heavy-handedness and more protests threatened to break out, Labour Minister Sekai Nzenza said public workers would get a monthly supplement of between 5 and 23 percent of their salaries from January to March while wage negotiations with unions continued. Police spokeswoman Charity Charamba told reporters that a police officer was stoned to death by protesters in Zimbabwe’s second city Bulawayo. She said two other people died during protests in Chitungwiza, south of Harare, and Kadoma, west of the capital. Mnangagwa, who is on an official visit in Moscow, said Zimbabwe was interested in receiving Russian loans and might need Russia’s help in modernizing its army, RIA news agency reported. The president has also promised a clean break from the repressive regime of his long-time predecessor Robert Mugabe, who was forced out in a de facto coup in November 2017. But critics accused Mnangagwa of resorting to Mugabe-style tactics to contain the current unrest. In Harare and Bulawayo, banks, schools, businesses and the stock market remained shut as many residents stayed at home. Security forces deployed to stave off further demonstrations, witnesses said, and people in Harare said they could no longer access the internet. Information Minister Monica Mutsvangwa said she was not aware of an internet shutdown and Zimbabwe’s three mobile telecoms firms had no immediate comment.